This species is accepted, and its native range is Cameroon to Kenya and S. Africa. Shrub or tree (0.3–)1–20 m. high, erect or ± spreading, unarmed, glabrous, with latex threads in branches, leaves, flowers and fruits, very variable; branches ± markedly 4-lined when young, eventually terete and longitudinally striate. Leaves not fasciculate, petiolate; lamina dark green and ± glossy above, paler beneath, ovate to narrowly lanceolate or rarely elliptic or elliptic-oblong, (1–)1.7–12.1(–13.5) × (0.5–)0.8–4.7 cm., acuminate and frequently mucronate to acute or rarely obtuse at the apex, with margin acutely glandular-denticulate to crenulate-denticulate or more rarely entire, cuneate or attenuate to rounded at the base, coriaceous to chartaceous, with lateral nerves and reticulate venation prominent beneath but not or scarcely so above; petiole (1–)2–7(–10) mm. long. Cymes 0.3–3 cm. long, monochasial after 1st to 3rd branching or pseudumbellate to fasciculate, axillary, sessile (fasciculate) or with peduncle up to 21 mm. long; pedicels up to 13 mm. long or more rarely absent, articulated at the base or in the lower 2/5; flowers ± 2–20 in each cyme or solitary, 3–5(–6) mm. in diameter, bisexual. Sepals 5, unequal, subcircular, rounded, 0.7–1.2 mm. long, with margin entire. Petals 5, green or white or white tinged red to deep red, broadly obovate to subcircular, 1.5–2.5 mm. long, sessile or shortly clawed, with margin entire. Stamens 5, much shorter than the petals, with filaments 0.1–0.2 mm. long, flattened, united with the outer margin of the disc. Disc 5-angled, concave, with very short free margin. Ovary 3-locular, pyramidal, ± half-immersed in the disc; style absent; stigma slightly 3-lobed. Capsule green or reddish-green to yellow or orange or red, 4–11 mm. long, 3-lobed (or globose to 2-lobed due to abortion), with lobes rounded, smooth, not fleshy. Seeds 1–3, orange-brown to dark brown, completely enclosed by a thin orange aril. Understorey and margin of upland or riverine forest; 1050–3300 m.
Shrub or tree (0·3)1–15 m. high, unarmed, glabrous, with latex threads in branches, leaves, flowers and fruits; branches ± markedly 4-lined when young, eventually terete and longitudinally striate. Leaves not fasciculate, petiolate;lamina dark green and ± glossy above, paler below, (1)1·7–12·1(13·5) × (0·5)0·8–4·7 cm., ovate to narrowly lanceolate or rarely elliptic or elliptic-oblong, acuminate and frequently mucronate to acute or rarely obtuse at the apex, with margin acutely glandular-denticulate to crenulate-denticulate or more rarely entire, cuneate or angustate to rounded at the base, chartaceous to coriaceous, with lateral nerves and reticulate venation prominent below but not or scarcely so above; petiole (1)2–7(10) mm. long. Cymes monochasial after 1st to 3rd branching or pseudumbellate to fasciculate, with peduncle up to 21 mm. long or more rarely absent, in axil of foliage leaves; pedicels up to 13 mm. long or more rarely absent, articulated at the base or in the lower 2/5; flowers c. 2–20 in each cyme or solitary, 3–5(6) mm. in diam. Sepals 5, unequal, 0·7–1·2 mm. long, suborbicular, rounded. Petals 5, green to white or white-tinged-red or deep red, 1·5–2·5 mm. long, broadly obovate to suborbicular, sessile or shortly unguiculate, entire. Stamens 5, with filaments 0·1–0·2 mm. long, flattened, united with outer margin of disk. Disk 5-angled, concave, with very short free margin. Ovary 3-locular, pyramidal, c. 1/2-immersed in disk; style absent; stigma slightly 3-lobed. Capsule yellow to orange or red, 4–11 mm. long, 3-lobed with lobes rounded, smooth, ascending, or 2-lobed to obovoid or globose due to abortion of 1–2 loculi. Seeds 1–3, orange-brown to dark brown, completely enclosed by an orange aril. Seeds orange-brown with white aril. Celastrus mucronatus Eckl. & Zeyh. Celastrus rupestris Eckl. & Zeyh. Robson, N.K.B. & al. (1994). 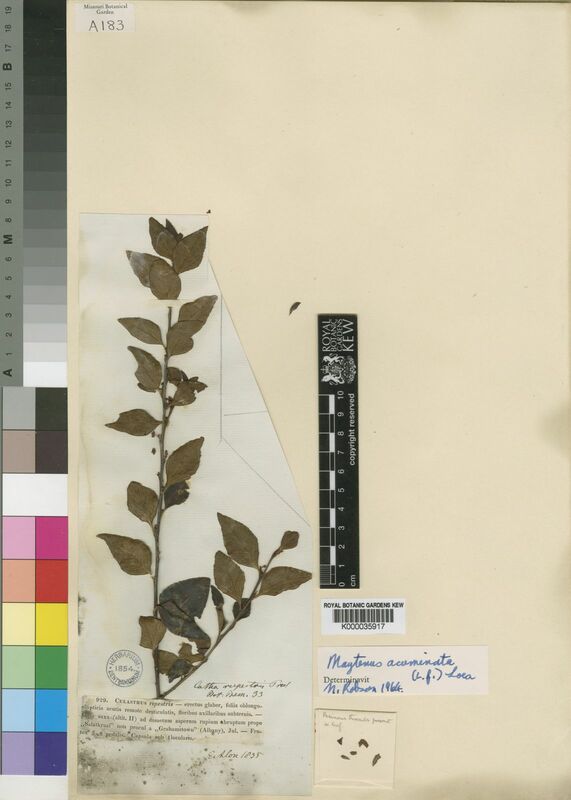 Flora of Tropical East Africa, Celastraceae: 1-78.
in E. & P. Pflanzenfam. 20B: 138 (1942). Troupin, Fl. Rwanda 2: 326, fig. 104.1 (1983). N. Halle in Fl. Pl. Lign. Rwanda: 201 (1982). J.-F. Villiers in Fl. Gabon 22: 8, t. 2 (1973). N. Robson & Sousa, Fl. Moçamb. 48: 19 (1969). N. Robson in Flora Zambesiaca 2:369 (1966). Dale & Greenway, Kenya Trees and Shrubs p. 135 (1961). Marais in Bothalia 7: 383 (1960). R. Wilczek in Flore du Congo Belge et du Ruanda-Urundi, 9: 115, t. 12 (1960). Loes. in A. Engler & K. Prantl, Die Natürlichen Pflanzenfamilien, ed. 2, 20b: 138 (1942).